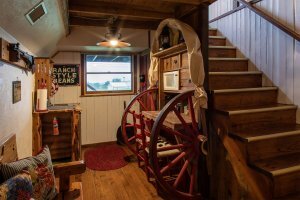 Larry Bill’s and Miss Becky’s were once part of the old hay barn from the historic dairy in the early 1900.s that has been lovingly restored. 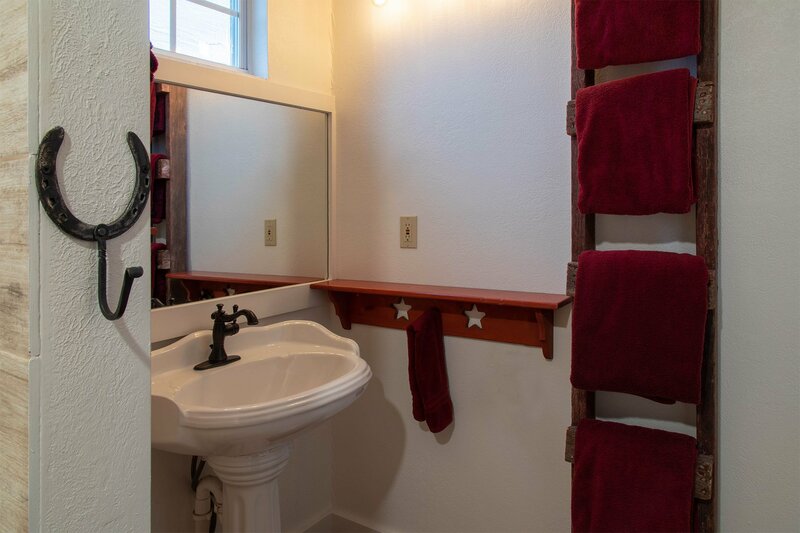 Downstairs has new hardwood floors and upstairs has the original longleaf pine floor that is beautifully restored. Make sure you look for other works by the artist that skillfully painted the Chuckwagon mural on our wall when visit historic downtown Fredericksburg, Texas. If you feet need a rest from a long day of shopping and antiquing, you may take your boots off while sitting on the hand-carved bench that the craftsman named "The Lonesome Longhorn". A old-time cattle drive camp cook would feel right at home in this chuckwagon kitchen and would surely be delighted with all the modern conveniences, which include a microwave oven, refrigerator, and a coffee pot. 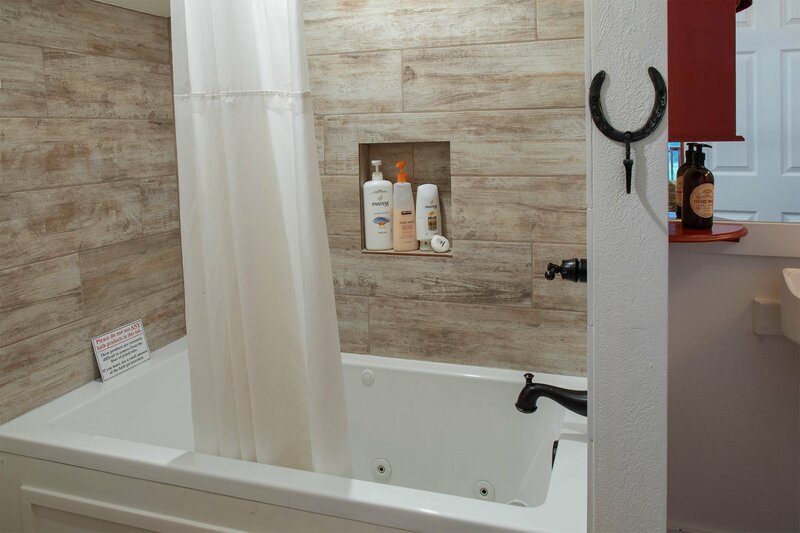 After watching a gorgeous sunset from your private balcony, you may want to soak in the combination Jacuzzi tub and shower. 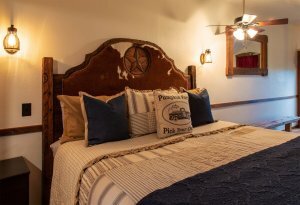 And it won't take a camp cook's rifle to convince you to snuggle down into this king-size, pillow-top mattress for one of the best night's sleep that you've ever had. Kitchenette with microwave, fridge, coffee pot and dishes. 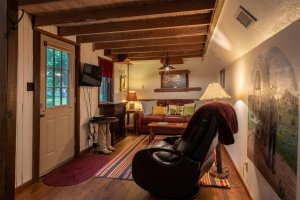 Downstairs sitting area, fireplace, leather sofa, flat screen TV, Blu-ray player, and Wi-Fi. 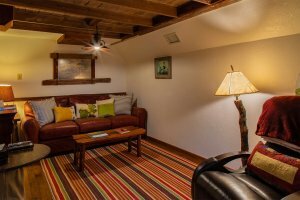 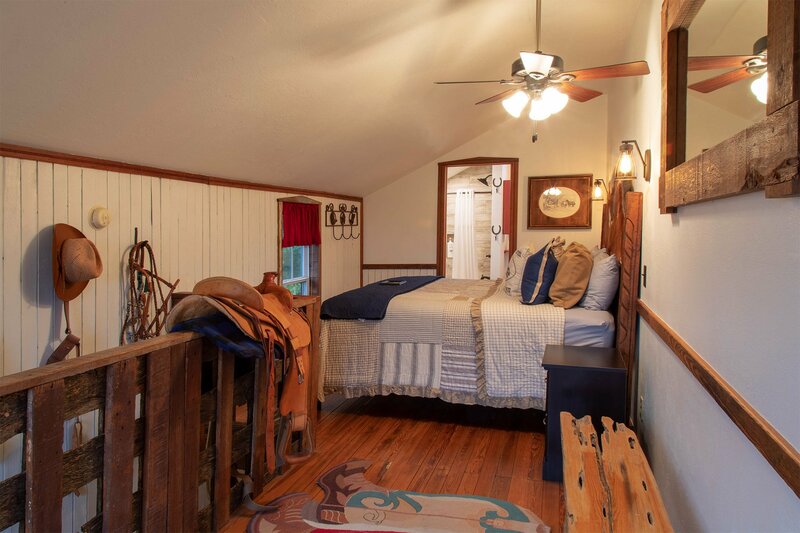 Upstairs has hand carved, king bed with ultra-plush pillow top mattress and deck overlooking the Texas Hill Country. 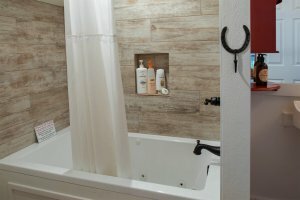 Bathroom has whirlpool tub with shower. 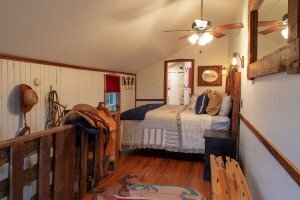 Each room has separate heating and cooling units.